Tip and tricks with preparing Asset Files, choosing the right format, and more. This File Guide is designed to help you decide what sort of brand asset files you should Download and Share (everyone) or Upload (Admins), depending on intended use. With downloading naturally you're looking for a file suitable to use in whatever application you are intending to use. Generally you should have an idea of the sort of file formats, colour-space and resolution you require. If not we hope the following will help you decide. When uploading, you'll need to consider what Downloaders (consumers of your Assets) are going to want for their workflows at download time. In most cases you should upload the source file, but in many cases you'll also want to consider uploading additional files that are more easily consumable generic file formats (e.g. a low res RGB .jpg for web use). Vector files: Vector artwork is artwork that is created in an illustration or drawing application like Adobe Illustrator and uses nodes and lines (vectors) to create shapes. Vector are scalebale and resolution independent. Raster files: Raster artwork is artwork that is created from dot or bits. A photograph is a raster file. Typically rasters are created with a camera or scanner or created with applications like Adobe Photoshop. Rasters do not scale well and resolution is important. Container files: Container files are files that hold both vector and raster files together. They can even contain videos and audio files. A commonly used container file is a PDF file. PDF's can be created by a number of applications including Adobe Illustrator, Photoshop, Indesign and many others. You can tell a lot about a file by it's file extension. Below is a list of common file extensions and their meaning. .ai = Adobe Illustrator. AI files are vector files (sometimes can include embedded raster files). .psd = Adobe Photoshop. PSD files are raster files. If saved as a .psd it can have advanced features like layers, clipping paths, editable text and more. Generally a PSD file will have be either a modified photographic image or a created piece of art. .tif = Tagged Interchange File Format. TIFF files are raster files. TIF's can include layers and transparency. 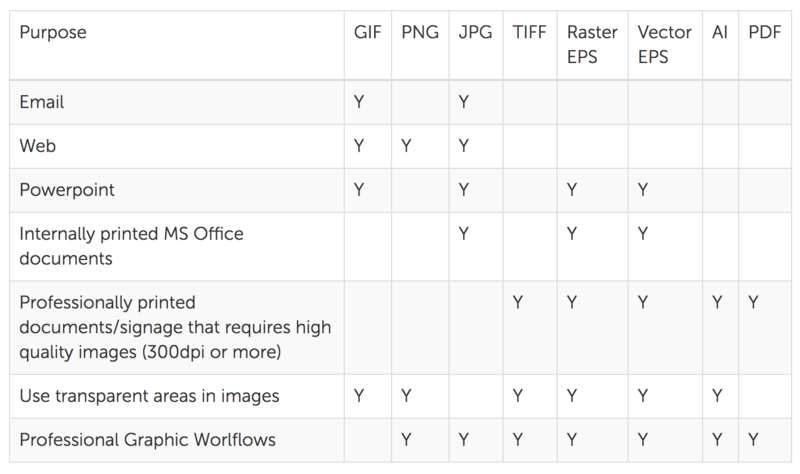 TIF's are often the preferred raster format for high resolution images for reuse in professional workflows. Brandkit recommends TIFF for high resolution raster images. We also suggest you save Tif's using the RGB colourspace in most cases and LZW lossless compression to prepare TIF files before upload. 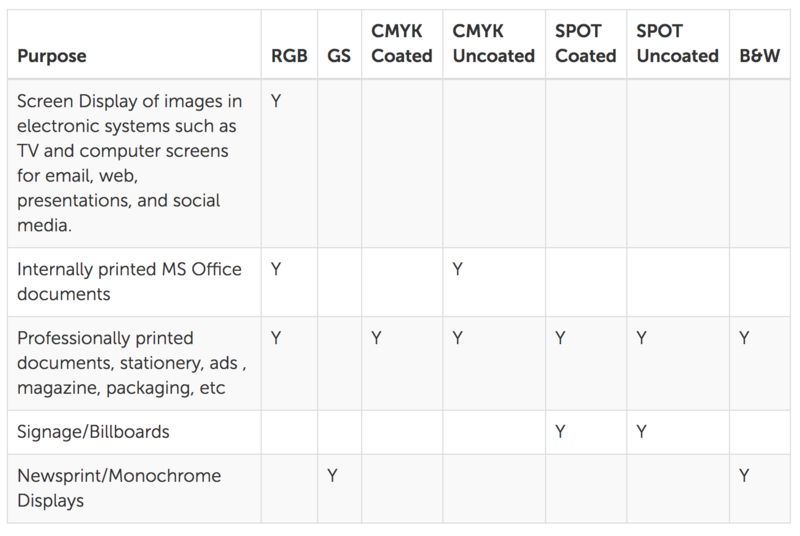 Also Avoid 16bit mode and CMYK for photography. .jpg = Joint Picture Experts Group raster image - one of the most commonly used raster formats and compatible with most modern applications. .png = Portable Network Graphics file. A great compact raster format that support alpha transparency and is used more and more on the web. But earlier web browsers such as IE 5/6 may have trouble displaying transparency correctly. This is a quick but by no means comprehensive guide as to what file types you'll(probably) need for a particular purpose. If you're going to print something you'll need a high resolution (300dpi) raster file or a vector file. CMYK is the primary colour-space for print but SPOT colour files give better colour control, although SPOT is usually used in vector files only (e.g. logos). RGB for photos is fine also as most printers will convert the RGB to CMYK using the appropriate colour-profile at print time. If you want something for the web, or a computer monitor - then you'll want an RGB(colour space) raster(type) file with a suitable resolution(72dip) and pixel size to suit your design. Typically JPG, PNG or GIF. If you're a designer or and going be giving the file to a designer, you'll most likely need a source vector or raster file. Probably an Adobe Illustrator(.ai or .eps) file for vector art and a Photoshop (.psd or .eps) or TIFF(.tif) file for raster art. Which file type do I need? For email use, GIF is best used for: ILLUSTRATIONS and line drawings such as logos, diagrams, etc, with only a few distinct colours. JPG is best used for: PHOTOGRAPHS and paintings of realistic scenes with smooth variations of tone and colour. PNG while supporting transparency, has limited compatibility in email software. For web use, GIF is best used for: ILLUSTRATIONS and line drawings such as logos, diagrams,etc, with only a few distinct colours. JPG is best used for: PHOTOGRAPHS and paintings of realistic scenes with smooth variations of tone and colour. PNG is best used for: PHOTOGRAPHS and paintings of realistic scenes with smooth variations of tone and colour where parts of the image require transparency. TIFF and Raster EPS is best used for PHOTOGRAPHIC images and paintings of realistic scenes with smooth variations of tone and colour. Vector EPS (line drawings) for logos or illustrations with only a few distinct colours. Which colour space do I need?